This long prom dress is crafted in a beautiful ball-gown style for prom, pageants, and more. Celebrating a Quinceanera? You're sure to love the full and fabulous design of this ball gown by PromGirl. In a beautiful white organza fabric, the formal ball gown has a fitted v-neck bodice with a wide band that defines the figure. 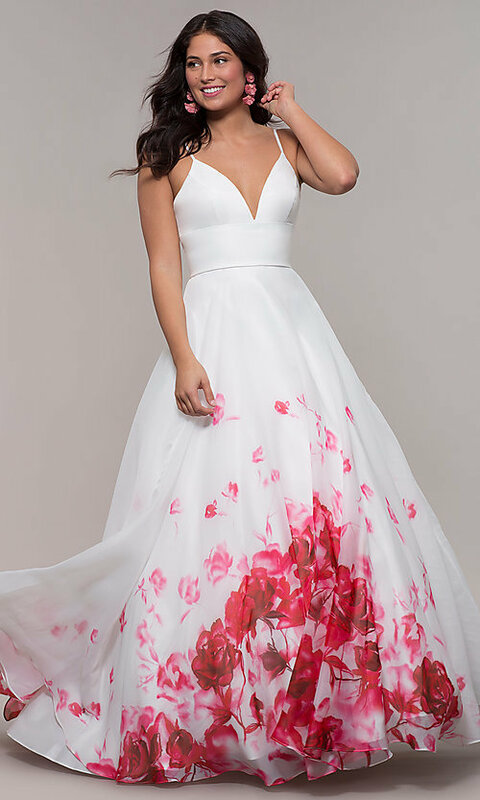 Layers of luxurious satin and volumizing tulle support the full and fabulous shape of the floor-length skirt, while a delicate watercolor floral print blooms across the bottom of the long prom dress. Feel like a princess in this v-neck ball gown for formal events.